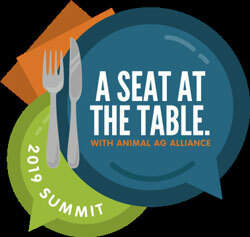 Early registration rates are available through Friday, February 1 for the Animal Agriculture Alliance’s 2019 Stakeholders Summit themed, A Seat At The Table. The event will be held May 8-9 at the InterContinental at the Plaza Hotel in Kansas City, Missouri. To view the agenda and register, visit https://www.animalagalliance.org/summit. The Summit will feature a panel titled, “Conversations Around the Table: Engaging Influencers” with Hana Bieliauskas, digital practice lead at Inspire PR Group, Ruth Woiwode, PhD, manager of livestock audit services at Food Safety Net Services, Lauren Lane, owner and blogger at Lauren Lane Culinarian and Adriane Heins of Heins Family Farms. The panelists will explore how to effectively engage with influencers about animal agriculture and connect with consumers about modern food production. Andy Vance of Feedstuffs will moderate the panel. The Alliance is hosting a photo contest to offer farmers the opportunity to win a free registration to the event and take their seat at the table. To enter, take a photo of a seat at your table, post it on Instagram or Facebook with a clever caption, tag the photo to @animalagalliance and use the hashtag #AAA19. Farmers can submit their photos through Saturday, February 10 and the Alliance team will select the top photos to be eligible for public voting. The five farmers whose photos receive the most votes will be announced as the winners on Friday, February 15. For full contest details, visit https://bit.ly/2sTmibu. Thank you to our 2019 Summit sponsors: Watt Global Media, Farm Journal Media, Meatingplace, National Provisioner, American Feed Industry Association, National Pork Producers Council, National Cattlemen’s Beef Association, National Pork Board, Smithfield, United Soybean Board, National Turkey Federation, Dairy MAX, Farm Credit, Country Folks, National Biodiesel Board, Summit Livestock Facilities, United Egg Producers, Cobb-Vantress, Inc., Council for Biotechnology Information, Protect the Harvest, American Veal Association, BPI Technology, Inc., Kemin, National Chicken Council, Live Oak Bank, North Carolina Farm Bureau, Vivayic, Eggland’s Best, Food Industry Environmental Network, Kansas Farm Bureau and Kansas Soybean.